Partners of CAPREIT can rest assured knowing we have a proven record of acquiring quality residential real estate. Our partners can expect integrity and candor in every interaction. We’ve closed approximately $4.5 billion in transactions with some of the world’s leading investors, giving us extensive knowledge of local markets and an entrepreneurial drive. Our acquisition team is quick to identify new opportunities, cover our due diligence, and effectively and efficiently close transactions designed to enhance long-term value. CAPREIT is poised to continue building and improving the performance of the core portfolio. The steady increase in household formations, overall moderate levels of new multifamily apartment construction, and our dedication to resident satisfaction have all contributed to the high occupancy rates found throughout the portfolio. Economic expansion has created increased demand for high quality rental housing, allowing for rental increases and enhanced portfolio value. We have the expertise to effectively capitalize on this environment, the critical mass to operate efficiently, the dedication to perform, and the resources to continue to grow and remain strong and prosperous. 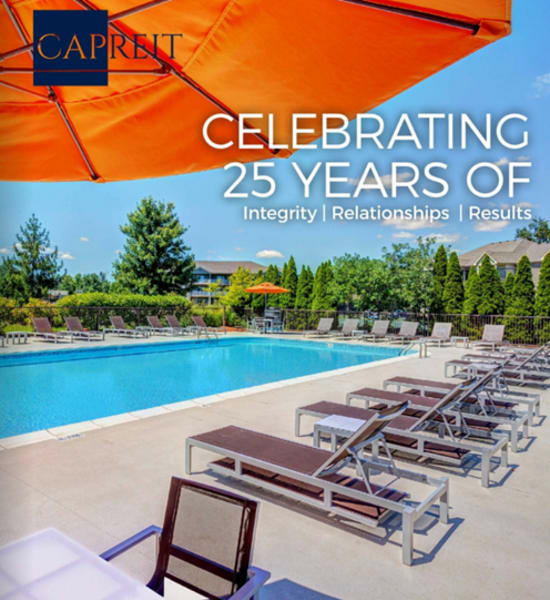 Those who invest with CAPREIT enjoy financial success as a direct result of CAPREIT’s focused acquisition strategies, innovative financial structures, and hands-on property management style. CAPREIT capitalizes on today's opportunities through strategic and selective acquisitions highlighting value-added growth.